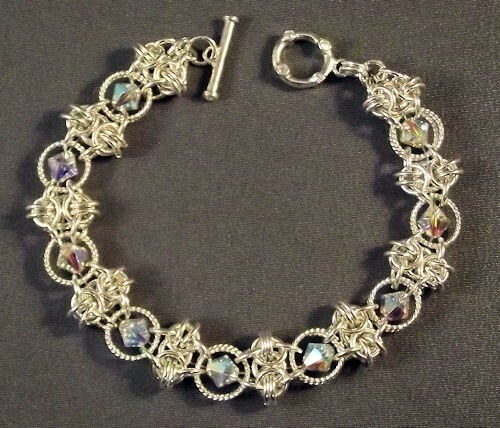 The Honeycomb with Bling Bracelet is a wonderful combination of stringing and chainmaille. The sparkle and texture in the bracelet makes a wonderful statement piece of jewelry. It is beautiful and comfortable to wear as it flows gently along your wrist. The kit includes the jump rings, but you may add an order for twelve Swarovski Bicone Crystal 2AB crystals if you desire. This crystal selection is what is shown in the bracelet in the picture. The clasp is not included.